Synopsis: Scott and the others try to find a way to change Malia back into a girl before Mr Tate can find her and kill her. Scott, Stiles, and Allison are still suffering under the effects of the Nematon. During Mr Yukimura’s class Stiles has a meltdown and Scott rushes him to the boy’s locker room to help him calm down and keep hold of reality. If there’s one thing I love about this show it’s the relationship between Scott and Stiles. I love how they can reach out to each other during moments of despair, like further on in this scene when Stiles tells Scott that they can’t help anyone and Scott assures him that they can try. Also think back to ‘Motel California’ when Scott is about to blow himself up and Stiles steps into the ring of gasoline to stop him. No matter the ups and downs of this show the love friendship between Scott and Stiles is a wonderful constant. Also great acting and I loved the juxtaposition of slow and fast motion in this scene, it really helped to make this scene jarring. Allison has another hallucination of Aunt Kate, this one much creepier than the last. She lies awake on an operation table as Kate and some men inspect her insides before they shift into werewolves and start feasting on her organs. The most interesting part of this scene has to be when Kate takes out Allison’s heart and says that “there’s definitely something wrong with it”. If this is all in Allison’s head that would suggest that what Kate said is what Allison is thinking herself, meaning she thinks her heart isn’t okay. Is that possibly referring to the fact that she’s starting to have feelings for Isaac, furthermore is that because that’s the second werewolf she’s liked and there’s a part of her that thinks that’s wrong because of the hunter side of her? I Does anyone else have thoughts on this? Scott decides that he’s use his Alpha authority to try and get Malia is change back into a human. He goes to the twins to help him control his wolf, even though they’re no longer alphas themselves. He, Stiles and Lydia go and meet them in Derek’s loft and they attack Scott to “help him”. What I want to know is why they are even still here? How are they still relevant in the show? Also I do not approve of them staying in Derek’s loft, the same place where they helped force Derek to kill Boyd? Kira’s having an even rougher time at school. First she tries to do something nice for Scott by printing information on Bardo only for her dad to reveal to Scott that Kira like him. Then when she tries to do another kind thing and return Scott and Stiles’ bags to them after they run out of the classroom she’s chased by the coyote. Luckily Scott is there to scare off the coyote before he can do anything. The Trio go to the woods, along with Isaac and Lydia, to find Malia before anyone else does. Isaac and Lydia step in animal traps Mr Tate has set up all around the wood to capture the coyote. Stiles, the only one with Lydia, has to figure out how to get her out of there before she gets hurt. Meanwhile Allison has to tranquilise Mr Tate, who’s also in the woods and is trying to shoot what could possibly be his own daughter. 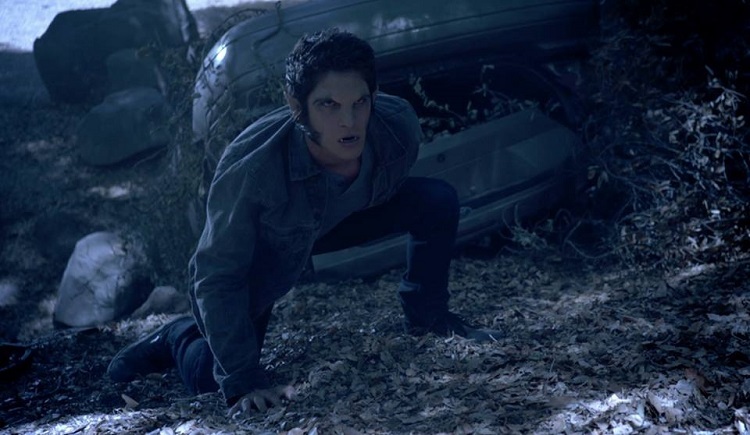 Scott’s running through the woods trying to chase the coyote in order to help her transform. 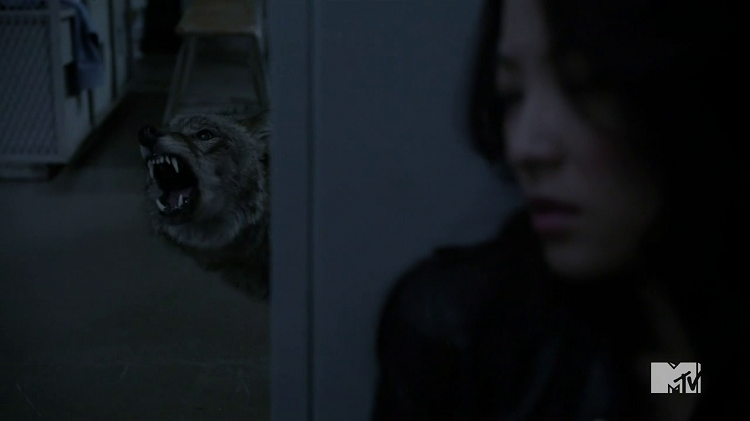 With Lydia’s encouragement Stiles figures out the trap and Allison manages to aim at Tate but the climax of the episode is r when Scott roars a fearsome alpha roar and Malia turns back into a human. The Sheriff returns her home and by then Stiles can read again. This short side story was interesting and I liked the pace of it. It was dragged out but it’s also still open enough for them to go back to later it if they want to. Though I hope this doesn’t mean that they’ve stopped exploring the trio’s psychological issues. There’s still so much potential and it would be a real waste if their struggles are just never addressed again. Meanwhile Derek and Peter have their own separate story. Stuck underground and being tortured over something called a “La Loba” it’s obvious that this won’t be the season that Derek will finally catch a break. Luckily it’s only Peter who has a finger cut off, even better though is the fact that the Hales are rescued by Breaden, who we were lead to believe was killed. Thank the lord she’s alive. These three find a chest, that’s connected to the “La Loba” somehow, and form it take out a cylinder with the triskele symbol on it. And in the last parting shots we see the Nematon. Fireflies escape from it forming into three mysterious figures. Apparently this tree isn’t finished with bring torment into Beacon Hills. I for one think that it’s about time someone burnt the entire thing down, it’d probably save everyone a lot of trouble. ← Del Rey’s Red Rising Release Day Flash Giveaway is Happening Now!